been tagged twice here goes 1!!! i'm in love w/MAC lip glass as well. i've been using them for years!!! explicit with chestnut lip liner...hot!!! You look hot! I luv, luv, luv, Sephora too. I always try on Stila lip gloss, Urban Decay eye shadows, and NARS blush and powder. Iman's beauty line was great, but she now sells in drugstores. Have fun! I just love this pic. You're so gorgeous. Thanks Helga, naturally Sophia and Gena. Nadz you are so sweet thanks putus(: when yuh ready I got the hook up! 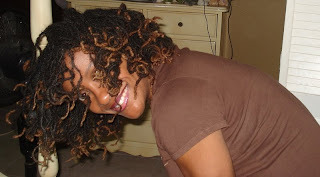 Your make-up and locs are georgeous here! Just lovely!! !